Zimbabwean President Robert Mugabe, heads of government and several former African presidents on Thursday joined the funeral service of former Botswana President Ketumile Masire who died last week at the age of 91. The funeral, held at Masire’s home village of Kanye in southern Botswana, was filled with laughter and memories of the jovial second president of Botswana who served between 1980 and 1998. Each speech at the funeral elicited laughter from the mourners as the speakers remembered the celebrated leader. Among the leaders present at the funeral were Botswana President Ian Khama, Lesotho’s King Letsie III, South Africa’s Deputy President Cyril Ramaphosa, Deputy Prime Ministers of Swaziland and Lesotho, Former Presidents Thabo Mbeki (South Africa), Armando Guebuza (Mozambique), Benjamin Mkapa (Tanzanian), Festus Mogae (Botswana) among other dignitaries. He was remembered for his role in various diplomatic initiatives in Africa, including chairing a panel that investigated the 1994 Rwanda genocide, co-ordinating the Inter-Congolese National Dialogue among other peace initiatives in South Africa, Ethiopia, Lesotho, Mozambique, Ghana and Swaziland. 93-year-old President Robert Mugabe of Zimbabwe remembered the struggle of Masire in the 1990s in the fight for peace in Congo, Mozambique, Rwanda and South Africa and the southern African region. “The death of Ketumile Masire has not only robbed Botswana of a great leader, but has also deprived southern Africa and the entire continent of a great statesman who served with valor and honour. “Even after retirement, Masire continued to be a servant of his people and humanity as he traveled the length of Africa in pursuant of peace and development … we come in tears because the man who we mourn here often rolled out the welcome mat regardless of the matter at heart; his ear was always ready to listen,” he said. Mugabe recalled his engagements with Masire before and after independence, as well as moments shared together. “Let us remember the road he has walked to walk it, or get our people and children to walk it,” he advised. Former South African president Thabo Mbeki said: “with his departure, we will miss his laughter which tinkled as clear as a bell, his quiet humour and his wise and invaluable advise given in gentle ways,” he said. “Eventhough he has departed the world of the living, we will still walk tall throughout the world because as Africans we can proclaim to all humanity that from this small acre of Africa was born a son Ketumile Masire whose quality of leadership made us proud to call ourselves Africans,” he added. He mentioned Masire’s influence in the struggle for the liberation of South Africa. 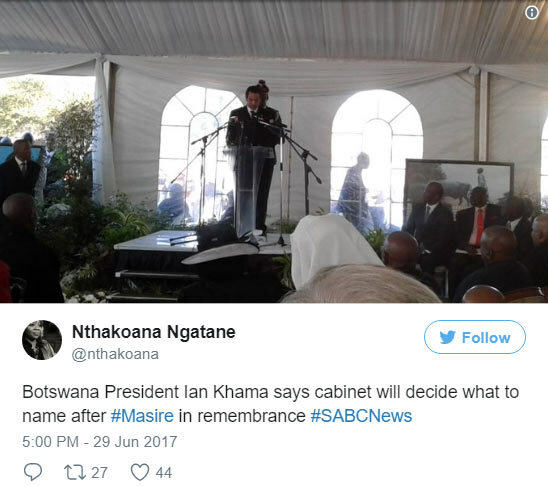 Botswana President Ian Khama amused the mourners as the last speaker after the family of Masire took turns to recall the happy moments of the departed former head of state. Khama cracked jokes about some dignitaries including Mugabe and government officials before offering his condolences to the family of Masire. “We should not only be mourning, but we should celebrate his life,” he said while thanking the public for partaking in the memorial service held on Wednesday. “When you hear someone say, what have Africans done for the world, you should say to them, what have Africans not done for the world, because we have done a lot. He said former Presidents Masire and Khama resisted pressure in the colonial times to stop freedom fighters from entering Botswana and … “based on our long standing principle for upholding human rights, we did not give in then nor shall we give in now. We will not be bullied and intimidated by anyone to abandon these principles”. Sir Ketumile Masire was buried immediately after the service as hundreds of mourners looked on. Sir Quett Ketumile Joni Masire was born in July, 1925 in Kanye, southern Botswana, to a cattle herding family. His love for education and academic achievement gained him a scholarship to study at the Tiger Kloof Educational Institute in South Africa where he graduated in 1950. While teaching in his country, he entered into farming and earned a Master Farmers Certificate in 1957. 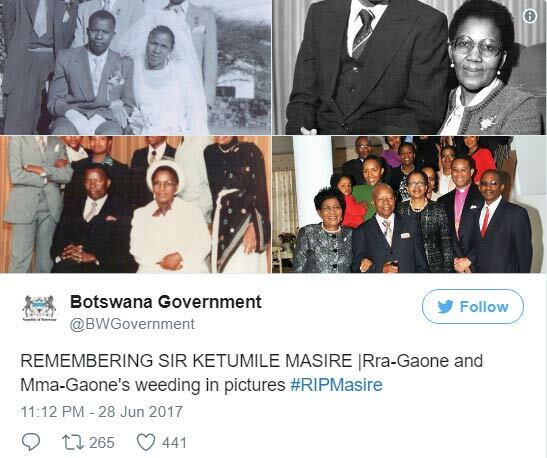 Masire also served as a journalist for the African Echo/Naledi ya Botswana newspaper in 1958 when he married his late wife Gladys Olebile Masire who died in 2013 leaving him behind with six children. He ventured into politics and help found the Botswana Democratic Party (BDP) which he served as its first secretary-general in 1961. The party won majority seats in the 1965 legislative elections and later, he became Deputy Prime Minister in 1966 and after independence, the country’s Vice-President and finance minister, serving under Seretse Khama until 1980. Five days after the death of Seretse Khama on July 18, 1980, Masire was elected president by secret ballot at the National Assembly. He went on to become chairman of the Southern African Development Community (SADC)and vice chairman of the Organisation of African Unity. He was also chairman of the Global Coalition for Africa and a member of the UN group on Africa Development. During this period, he earned three Honorary Doctorates of Law (L.L.D.) from two universities in the United States and one in the United Kingdom. He also earned two Honorary Doctorate of Humane Letters from two other universities in the United States. In 1989, he was awarded the Africa Prize for Leadership for the Sustainable End of Hunger and the Grand Counsellor of the Royal Order of Sobhuza II in Swaziland. He was also knighted by the Queen of England in 1991 with the Grand Cross of Saint Michael and Saint George, earning him the title Sir. Masire also earned Namibia’s Order of the Welwitschia which is one of the highest honours of the land. He retired as president in 1998 but continued with diplomatic initiatives in Africa including leading the panel that investigated the 1994 Rwanda genocide, co-ordinating the Inter-Congolese National Dialogue among other peace initiatives in South Africa, Ethiopia, Lesotho, Mozambique, Ghana and Swaziland. Masire set up the Sir Ketumile Masire Foundation in 2007 to promote the social and economic well being of Botswana as well as co-founded the Global Leadership Foundation to promote good governance and resolve conflict through mediation. Sir Ketumile Masire died on June 22, 2017 in a hospital in Botswana’s capital Gaborone after he was hospitalized on June 18.